Will the Real Google gPhone Please Stand up! Will the real Google Phone, gPhone, or whatever the heck it's going to be called please stand up? Enough of the hype and enough of the teasing. I can't take it any more. The latest tease comes from The India Street, which writes, "we've just confirmed a tip from an industry insider that China's e28 is going to be Google's Gphone software and handset manufacturer. We have not been able to confirm whether the Chinese smart phone manufacturer will have the exclusive Gphone rights. E28 is a leading provider of mobile Linux convergence technology and will fit the Google mantra of keeping everything open." Apparently, E28 worked in conjunction with NewStep Networks' solution for fixed-mobile convergence (FMC), which can provide a fully-VCC (Voice Call Continuity) compliant mobile phone handset running on E28's Linux-based open source operating system. In fact, they recently completed testing of a seamless handoff of GSM/VoIP interoperability over WLAN and cellular networks, essentially allowing for handoff of calls from WiFi to GSM or the reverse. The E28 features WiFi (802.11b/g) and GSM Quad-band. The ultra-thin handset device also offers multimedia, productivity and data streaming features such as IPTV, MP3, Video recording and playback, handwriting recognition and Personal Information Management (PIM) . 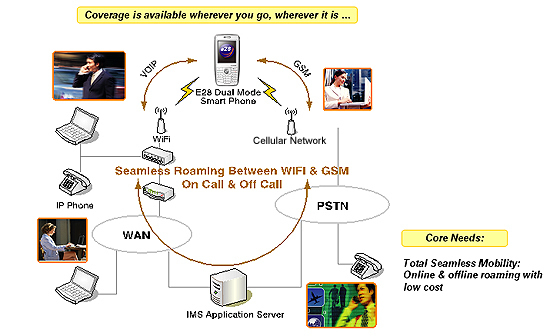 They also promote it as "integrated with WLAN VoIP & VCC for a seamless communication experience." Certainly the open source Linux operating system on the E28 mobile phone and the seamless handoff of calls from GSM to VoIP makes sense as to why Google would chose e28. Definitely seems pretty cool. In fact, the integrated VoIP functionality and seamless hand-off from WLAN to cellular gives Google two huge advantages over the Apple iPhone. Not sure what carrier in the U.S. is going to be willing to go for this - they've been slow to adopt allowing mobile VoIP calls on their networks. Some outright block it like T-mobile. Maybe I need to rescind my statement from yesterday where I said the Google Phone (gPhone?) would be underwhelming since the Apple iPhone set the bar of expectations so high. Of course, the E28 phone being the Google Phone is still pure speculation, damn it! \nWill the real Google Phone, gPhone, or whatever the heck it's going to be called please stand up? Enough of the hype and enough of the teasing. I can't take it any more. The latest tease comes from The India Street, which writes, "we've just confirmed a tip from an industry insider that China's e28 is going to be Google's Gphone software and handset manufacturer. We have not been able to confirm whether the Chinese smart phone manufacturer will have the exclusive Gphone rights. E28 is a leading provider of mobile Linux convergence technology and will fit the Google mantra of keeping everything open." \nApparently, E28 worked in conjunction with NewStep Networks' solution for fixed-mobile convergence (FMC), which can provide a fully-VCC (Voice Call Continuity) compliant mobile phone handset running on E28's Linux-based open source operating system. In fact, they recently completed testing of a seamless handoff of GSM/VoIP interoperability over WLAN and cellular networks, essentially allowing for handoff of calls from WiFi to GSM or the reverse. \nThe E28 features WiFi (802.11b/g) and GSM Quad-band. The ultra-thin handset device also offers multimedia, productivity and data streaming features such as IPTV, MP3, Video recording and playback, handwriting recognition and Personal Information Management (PIM) . They also promote it as "integrated with WLAN VoIP & VCC for a seamless communication experience." \nCertainly the open source Linux operating system on the E28 mobile phone and the seamless handoff of calls from GSM to VoIP makes sense as to why Google would chose e28. Definitely seems pretty cool. In fact, the integrated VoIP functionality and seamless hand-off from WLAN to cellular gives Google two huge advantages over the Apple iPhone. Not sure what carrier in the U.S. is going to be willing to go for this - they've been slow to adopt allowing mobile VoIP calls on their networks. Some outright block it like T-mobile. Maybe I need to rescind my statement from yesterday where I said the Google Phone (gPhone?) would be underwhelming since the Apple iPhone set the bar of expectations so high. 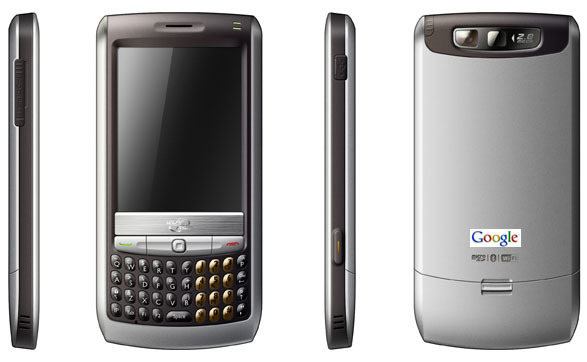 Of course, the E28 phone being the Google Phone is still pure speculation, damn it!